Last night we began the Triduum with an especially child-friendly Maundy Thursday service. We gathered for confession and absolution around the baptismal font where children dipped their fingers in the water and marked one another with the cross of Christ. We listened to the stories and got a taste of the Israelite Exodus from slavery, the quickly made unleavened bread of the Passover meal, and Jesus’ Last Supper. Dr. Suess’s Foot Book showed up somewhere too, before children and parents washed one anothers’ feet. We gathered around the table with communion bread many of the kids helped bake on Palm Sunday. Then before leaving the sanctuary in lights-dimmed silence, Psalm 22 was read from the pulpit by one fifth grader as kids of all ages silently stripped the altar… everyone being reminded how Christ walked from the meal to his suffering and death. It was a powerful beginning to the three days of Maundy Thursday, Good Friday and Easter Vigil. Wrapped in mystery, it is usually more meaningful to answer questions about Jesus’ last days with first-hand experiences than with words alone. Experiential learning strategies tend to speak to the whole child. Readings, visual demonstrations and discussions are good, but actively engaging kids in practices of faith offers a significantly better chance it won’t be forgotten. If we involve kids in teaching what they’ve learned, that’s even better. What that means for Maundy Thursday is that at the very least we invite families to participate in the experience of remembering Jesus’ Last Supper, the washing of the feet of Jesus’ disciples, and Jesus’ command to love one another. That’s a lot for one day. It’s also a lot to miss. It is on this Thursday before Easter — the night before Jesus’ death — we remember Jesus wearing a servant’s apron and washing his disciples’ feet, giving the command to love one another. It is also on this night where Jesus promises “this is my body and blood;” the radical newness in Jesus’s command to his disciples to participate in the Eucharist. This is also a night of garden prayer and swords and disciples who ran away in fear. I cannot imagine a better day than Maundy Thursday for kids and families to encounter the mystery of Christ’s presence given for us in the bread and wine, together with God’s Word. Invite kids and families to be a part of this very special night. And tell the stories afterwards. Make it a big deal, because it is. 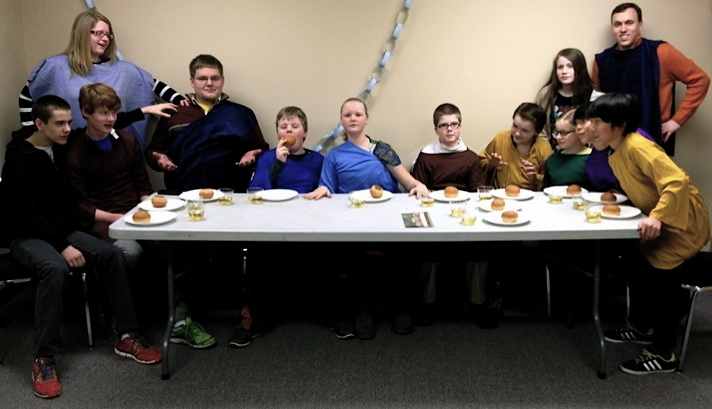 For fun, in advance of Maundy Thursday, we asked one class of kids to dress up as disciples and act out Jesus’ Last Supper with the Gospels. 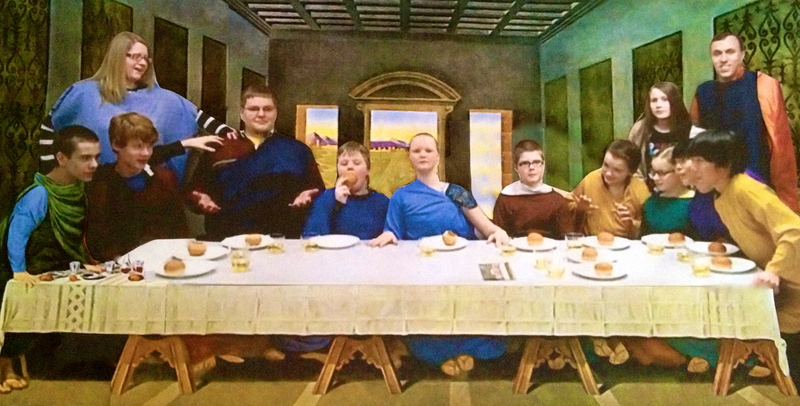 In addition to the regular table and chairs, they were given a photocopy of Leonardo da Vinci’s Last Supper painting, 13 costumes, rolls, cups and juice to set the scene. Thank you, this site has been helpful as we plan out our first family friendly Maundy Thursday service!